Apple may venture into unchartered waters with its own TV service, by offering up access to live programming on local channels...eventually. Re/code reports Apple is looking to set its upcoming Web TV service apart from the competition by giving customers in cities around the US programming from their local channels. Its main rival, Sling, boasts affordable online TV without the cable company hassle at around $20/month, while rumors indicate that Apple plans to price its service in the $30-40 range. According to one executive familiar with Apple’s plan, the service is meant to have mass appeal, saying, “this is supposed to be for 30 million people.” Wider appeal is certainly a valid strategy for persuading would-be customers to spring for the extra $10-20 a month over Sling. Apple’s ambitious moves may come at price, as negotiations for local broadcasts are a tangled web of sorting use rights and franchises for every station. If Apple aims to include local programming with its Web TV service, it’s unlikely that we’ll hear its announcement at Apple’s Worldwide Developer Conference on June 8. 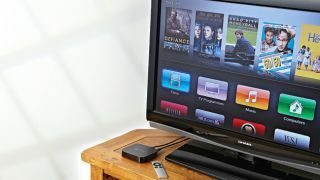 The Cupertino company will also be hard-pressed to meet its rumored goal of a fall release for its TV service. Historically, negotiations for local broadcasts and commercials can take months, even years. ABC spent two years getting the rights to local programming to broadcast on its Watch ABC app, which only works in 8 cities. It’s probable that Apple won’t meet its previous fall deadline for the upcoming Web TV service, but sources close to Apple say the company is optimistic about its eventual launch. Until then, we will just have to buy some rabbit ears and watch our local weatherman the old fashioned way.